This week I have continued to work on flowers. 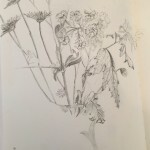 Above is a pencil sketch of a bunch of flowers in a vase which had started to look past their best but I thought the withering leaves were interesting to draw and made different shapes. 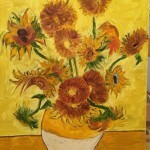 A fun exercise was to do a copy of the famous Sunflowers painting by Van Gogh. As this is originally an oil painting and I had a small canvas available, I thought it would be fun to copy it in oils. I started by sketching in charcoal and then completed the painting in water soluble oils (something Van Gogh certainly never used). I had lots of fun with it and am actually really pleased with the result and it makes me want to try an original picture of flowers but in a similar loose style.